This essay was originally published in the October 2017 edition of the NewsNet, ASEEES’ newsletter, which carries news of the profession and the association and is published five times a year. 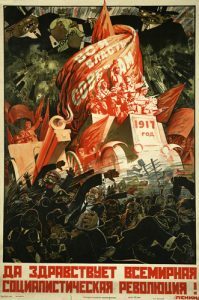 The centenary of the Russian revolution is being marked on the campus of the University of Chicago by two exhibitions. At the Smart Museum of Art Revolution Every Day displays revolutionary posters along with historical and contemporary time-based works to immerse visitors into the distinct textures and tempos of life that arose in the wake of revolution, and that have lingered stubbornly since the demise of the Soviet Union, informing the prospects of revolutionary change in our day. Next door, at the Regenstein library, the Special Collections Research Center is presenting Red Press: Radical Print Culture from St. Petersburg to Chicago, which puts visitors onto the revolutionary street, surrounded by the printed media that produced and disseminated revolutionary (and counterrevolutionary) ideology. The exhibitions anchor a range of courses, conferences and lectures, held across Chicago and Evanston, that will explore the revolution and its ramifications, including a special reception at the Smart Museum and the North American premiere of Dziga Vertov’s film The Three Heroines (1938) at the University of Chicago’s Film Studies Center on the evening of November 10, during the 2017 ASEEES Convention. Curated by Christina Kiaer, Robert Bird, and Zachary Cahill, with Diane Miliotes of the Smart Museum, Revolution Every Day is based around a handful of time-based that convey the duration of lived experience in revolutionary situations. Center stage is occupied by clips from films by renowned Soviet director Dziga Vertov—not his famous avantgarde documentaries of the 1920s, but his poetic documentaries of the 1930s—Three Songs about Lenin (1934), Lullaby (1937), and the unreleased and largely unknown The Three Heroines (1938) —in which female subjects speak impromptu, in real time, about life and labor under Stalin. In conjunction with the exhibition the Film Studies Center of the University of Chicago will screen all three films from 35mm prints from the Austrian Film Museum. Liberation that re-enacts African-American women’s tales of slave emancipation and civil rights struggles in the United States for our own times. experience of revolution, rather than their technique or avant-garde status, Revolution Every Day challenges the familiar oppositions between avant-garde and Socialist Realism, art and propaganda. In addition to these historical works, Vitaly Komar’s large-scale Ideal Slogan (1972/2017) hangs at the entrance to the Smart Museum, confronting visitors with a series of blank white squares on a red background, like a fill-in-blanks marching banner. Revolution Every Day thus animates the thrill, the anxiety, the violence, the puzzlement, and the labor of revolution as it was, is, and may again be experienced by those in whose name it was wrought. recent video work and the earlier Soviet materials. The exhibition mixes post-Soviet works together with Soviet ones, placing them into conversations that can suggest unexpected continuities as well as contrasts. The viewing space deliberately juxtaposes the durational aspects of watching and listening to videos with the seemingly more abrupt experience of taking in propaganda posters. marches, or to Beethoven’s melancholy Marmot played by a learner, allowing the hopes and doubts of revolution to invade their own experiences of the everyday. Curated by an interdisciplinary team of students under the supervision of Robert Bird and William Nickell, Red Press presents a street-level view of the Russian revolutions by drawing on the holdings of the University of Chicago Library, particularly the collections amassed by Samuel N. Harper, the first American scholar to have devoted a career to the study of Russia. During his extensive sojourns in Russia Samuel Harper collected firsthand documentation of Russian culture and politics from 1904 to the late 1930s, with a particular emphasis on the dramatic events between 1905 and 1917. In January 1905 Harper was on Palace Square in St. Petersburg during the infamous Bloody Sunday encounter. In the summer of 1917 he was back in the imperial capital, now named Petrograd, to witness the tumult between the February and October revolutions. In between he spent half of each year at the University of Chicago teaching courses in Russian, laying the foundations of the University’s programs in Russian studies. Red Press augments Harper’s collection of handbills, pamphlets, and other revolutionary ephemera with material from other holdings in Special Collections that document how Russia’s revolution was described, imagined and disseminated, from the Far East to the streets and universities of Chicago. It traces the dissemination of radical ideas through the popular press, from pamphlets and broadsides to calendars, from 1905 to the US pamphlet wars of the 1950s. Others feature images of revolution and counter-revolution in the pre-revolutionary satirical press and in post-revolutionary editions of The Protocols of the Elders of Zion. An entire wall tracks the development of revolutionary imagery through satirical journals from the 1905 revolution, anti-German pamphlets from the First World War, and Soviet posters from the 1920s, 1930s and 1970s. Another wall is plastered with handbills and broadsides from Harper’s collection, providing viewers a street-level view of revolutionary Russia. and overlooked pockets of innovation in later Soviet modernism and demonstrate that bold experiments continued in the face of dominant aesthetics in music, literature, and the visual arts. Participants will introduce lesser-known Soviet artists of the 1940s–1960s, placing their legacies in a continuum from the early Soviet avant-garde to post-Soviet culture and re-inscribing these artists into their global context. The conference was accompanied by a festival dedicated to the music of Galina Ustvolskaya. 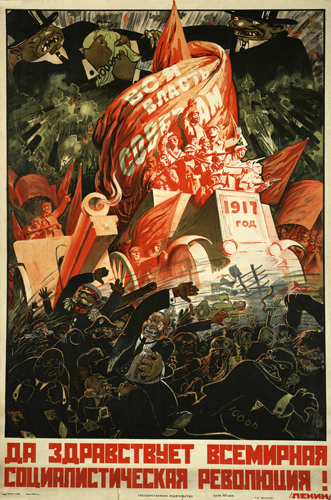 At the Bolshevik Contagion, convened by Robert Bird and Sheila Fitzpatrick on November 3-4, specialists in Russian intellectual history examined key individual texts—from Marx and Engels’s Communist Manifesto to Bukharin and Preobrazhenskii’s ABC of Communism—that produced and disseminated revolutionary ideas around 1917. This is the first in a series of conferences under the auspices of Revolutionology, a project funded by the Neubauer Collegium at the University of Chicago. avant-garde art, Revoliutsiia! Demonstratsiia! Soviet Art Put to the Test at the Art Institute of Chicago. While the revolution evokes contradictory reactions, and while Russia seems intent on ignoring the centenary, in Chicago at least this autumn will be all revolution, every day. Robert Bird is Professor at The University of Chicago, Department of Slavic Languages and Literatures, The Department of Cinema Media Studies, Fundamentals: Issues and Text. Christina Kiaer is an Associate Professor in the Weinberg College of Arts and Sciences Department of Art History at Northwestern University. William Nickell is Associate Professor of Russian Literature and Chair of the Slavic Department at the University of Chicago. This entry was posted in Essay, Event Recap and tagged Art Institute of Chicago, ASEEES, Cauleen Smith, Christina Kiaer, Dziga Vertov, Lene Berg, Lullaby, Northwestern University, Olga Chernysheva, Picasso, Red Press: Radical Print Culture from St. Petersburg to Chicago, Regenstein Library, Revolution Every Day, Robert Bird, Russia, Russian revolution, Samuel N. Harper, Smart Museum of Art, The Three Heroines, Three Songs about Lenin. Bookmark the permalink. It is really very great information about the revolution of the Russian. It is very important to know about the sacrifice, invention and all about the things which the country faced at a time.